Introduction: Histopathological diagnosis of specimens is greatly dependent on good sample preparation and staining. Both of these processes is governed by diffusion of fluids and dyes in and out of the tissue, which is the key to staining. Diffusion of fluids can be accelerated by the application of heat that reduces the time of staining from hours to the minute. We modified an inexpensive model of kitchen microwave oven for staining. 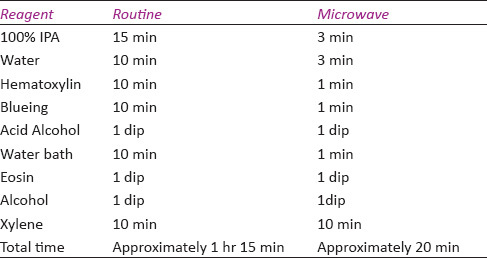 This study is an attempt to compare the reliability of this modified technique against the tested technique of routine staining so as to establish the kitchen microwave oven as a valuable diagnostic tool. Materials and Methods: Sixty different tissue blocks were used to prepare 20 pairs of slides for 4 different stains namely hematoxylin and eosin, Van Gieson's, 0.1% toluidine blue and periodic acid-Schiff. From each tissue block, two bits of tissues were mounted on two different slides. One slide was stained routinely, and the other stained inside a microwave. A pathologist evaluated the stained slides and the results so obtained were analyzed statistically. Results: Microwave staining considerably cut down the staining time from hours to seconds. Microwave staining showed no loss of cellular and nuclear details, uniform-staining characteristics and was of excellent quality. Interpretation and Conclusion: The cellular details, nuclear details and staining characteristics of microwave stained tissues were better than or equal to the routine stained tissue. The overall quality of microwave-stained sections was found to be better than the routine stained tissue in majority of cases. Diffusion of dyes into the cells, which is a physical process. Binding of the dyes to the substrate, which is both physical and chemical. The procedure of staining is generally hectic and requires hours for its completion. It is well-known that the application of heat decreases the viscosity of the fluids thereby increasing the diffusion of the fluids. , It is known fact that the application of heat while staining hastens the staining procedure and microwave provide uniform heating and helps in hastening staining along with providing better results. Evaluate the reliability of microwave staining using a kitchen microwave oven as against routine staining. Assess the time required for microwave staining as against the routinely stained specimen. Assess the quality of the microwave stained tissue specimens as against the routinely stained specimen. Sixty formalin fixed routinely processed tissue blocks were used from the archival for this study. Normal, benign and malignant blocks from the archival material were selected based on the stains used in the study. We used regular equipment, reagents and dyes for staining along with a basic model of kitchen microwave oven. The results obtained were tabulated on excel sheet and statistically analyzed by Student t-test. The kitchen microwave oven used in this study was operated at the lowest output of 100 W throughout the study. The pretreated slide color coded to be stained in the microwave was placed on a petridish containing tap water and placed in the outermost rotating table of the microwave [Figure 1]. The slides were first treated with 100% isopropyl alcohol for dehydration and then appropriate reagents of different stains were used. The tissue sections on slides were flooded and replenished with reagent and dyes with the help of a pipette except for water as it did not evaporate as fast as the reagent and dyes. Bluing procedure and washing the slides in water was also done with microwave irradiation itself. Dipping in 1% acid alcohol and eosin (where ever applicable) was done as per routine staining without microwave irradiation. Tap water in the petridish was periodically changed to avoid it from becoming warm. The staining protocol followed for both routine staining and microwave staining for the four different stains namely H and E, Van Gieson's, 0.1% toluidine blue and PAS [[Table 1], [Table 2], [Table 3], [Table 4], respectively]. A 20 pair of slides were stained for each of the four stains namely H and E, Van Gieson's, 0.1% toluidine blue and PAS. 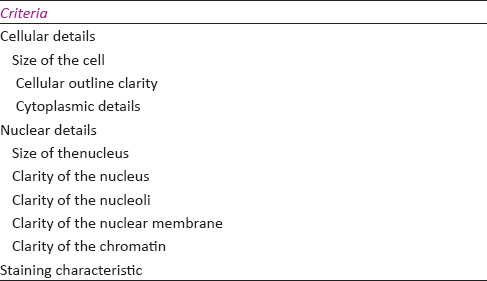 The stained slides were graded for cellular details, nuclear details and staining characteristics [Table 5], the results of which are as follows. Among the 20 pair of stained slides, cellular detail of routinely stained slides were graded as average in majority of cases (14 cases); followed by a 4 cases (20%) graded as good and 2 cases (8%) graded as poor (instead of few please give exact number and percentages) as against the microwave stained sections, which were graded as good in majority of the cases, followed by average grade and none was graded as poor. In the nuclear detail, the size of the nucleus, the clarity of the nucleus and the clarity of the nuclear membrane of the routine stained sections were graded as average in majority of the cases whereas the nuclear details of microwave stained sections were graded as good in majority of the cases. The clarity of the nucleoli and clarity of the chromatin of both routine stained sections and microwave stained sections were graded as poor in the majority of the cases. The staining characteristics of both routine and microwave stained sections were graded predominantly as good (16 cases; 80%) and 4 cases (20%) as average [Table 6] and [Figure 1]a and b. Among the 20 pair of stained slides, the cellular details of both routinely stained and microwave stained sections were predominantly graded as average. The nuclear details of both routine stained and microwave stained sections were graded as average to poor and were found to be unsatisfactory. The staining characteristic of both routine stained and microwave stained sections were predominantly graded as average [Table 7] and [Figure 2]a and b. Among the 20 pair of stained slides, the cellular details of both routine and microwave stained sections were predominantly graded as good except for the cellular outline clarity. 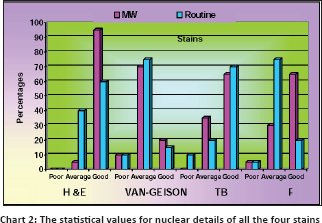 The nuclear details of the routine and microwave stained sections were graded as average in the majority of the cases. The staining characteristics of the both microwave and routinely stained sections were predominantly graded as good [Table 8] and [Figure 3]a and b. 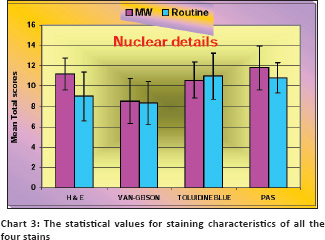 The statistical values of the four stains namely H and E, Van Gieson's, 0.1% toludine blue, PAS with respect to cellular details, nuclear details and staining characteristics [Charts 1-3 respectively]. 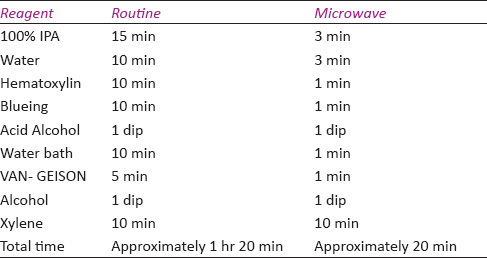 We noted in our study that routine staining with H and E consumed approximately 1 h 15 min whereas staining in microwave consumes around 20 min. Routine staining with Van Gieson's consumed approximately 1 h 20 min whereas microwave staining consumed around 20 min. Routine staining using 0.1% toluidine blue consumed around 55 min but the microwave staining consumed around 17 min. 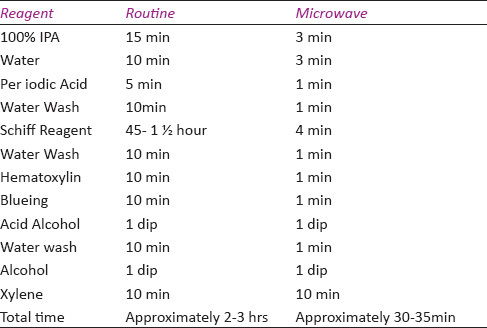 Sections stained routinely with PAS consumed around 2-3 h in comparison to the microwave stained sections, which required approximately 30-35 min [Chart 4]. Laboratory microwave is highly preferred for histopathology as it offers many advantages, but is expensive and cannot be afforded by small laboratories and educational institution. Hence, in this study, we used an inexpensive kitchen microwave oven with temperature control measures. Previous studies have shown that microwave could be operated at and above 350 W wherein the time is in turn reduced to seconds. ,,, However, we decided to operate the kitchen microwave at the lowest output of 100 W in order to avoid damage to the tissues by excess heat. The exact temperature at which the microwave was operated was not assessed and has remained variable throughout the study. Hence, we took temperature control methods to counteract the excess temperature with the help of tap water in petridish over which the slides to be stained were placed as mentioned in a review. The maximum efficiency of the microwave is at the outermost rotating table. Hence, we placed the petridish along with the slides to be stained in the outermost rotating table of the microwave. Use of xylene within the microwave was completely avoided within the microwave, as they are highly combustible. We noted in our study that the sections tolerated the minimum output power of 100 W, but the time of exposure was dependent on the reagent or fluid and the quantity in which they were used that is, sections covered with distilled water tolerated 100 W power for whole of 3 min cycle without requiring replenishment in between. However, the sections covered with 100% isopropyl alcohol tolerated the power of 100 W the whole of 3 min cycle with replenishment of the alcohol in between. This could be because alcohol evaporates 2.2 times faster than water and application of heat hastens this process. The dyes used in this study were exposed for ≤1 min except for Schiff's reagent, which was exposed for 4 min. 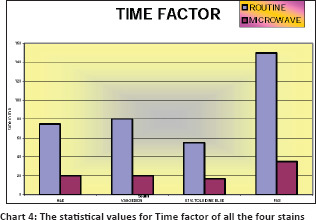 In the Van Gieson's stained slides, the cellular details, nuclear details and staining characteristics of the microwave stained sections were found to be statistically similar to the routine stained sections with the P value of 0.726, 0.918 and >0.05, respectively, whereas the time factor of the microwave stained sections were statistically better than the routine stained sections with the P value of <0.05 [Figure 2]a and [Figure 2]b. 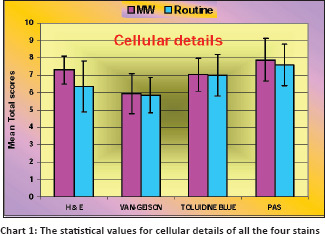 In the 0.1% toluidine blue stained slides, the cellular details, nuclear details and staining characteristics of the microwave stained sections were found to be statistically similar to the routine stained sections with the P value of 0.935, 0.343 and >0.05, respectively, whereas the time factor of the microwave stained sections were statistically better than the routine stained sections with the P value of <0.002 [Figure 3]a and [Figure 3]b. In the PAS stained slides, the cellular details of the microwave stained sections were found to be statistically similar to the routine stained sections with the P value of 0.222, whereas the nuclear details, staining characteristics and time factor of the microwave stained sections were found to be statistically better in comparison to the routine stained sections with the P value of 0.050, 0.004, and <0.001, respectively [Figure 4]a and [Figure 4]b. The cellular outline clarity of the mast cells stained with 1% toluidine blue was unsatisfactory as few of the mast cell was in a degranulating state. The nuclear details of few mast cells could not be satisfactorily assessed as the metachromatic granules in the mast cell obscured the nucleus. The main difficulty we faced in the study is microwave-stained sections showed lifting-up off tissues. This was more pronounced during the bluing procedure in H and E and after application of Schiff reagent in PAS staining. We tried to overcome this by coating a thick layer of egg albumin to the slides to be stained in microwave. This method to some extent did avoid lifting-up off tissues but in turn gave rise to increased background staining of the slides stained in microwave. The limitations of our study are the longevity of the histological quality is to be ascertained. Furthermore, we have used only soft tissues for our staining procedure. Microwave staining was found to be far better than routine staining in H and E and PAS with the time greatly reduced (1/6 th and 1/5 th ). Microwave staining was found to be similar to routine staining in 0.1% Toluidine Blue and Van Gieson's with the time greatly reduced (1/3 rd and 1/5 th ). Microwave can be used as a valuable adjunctive tool for staining and as an alternative to routine staining without compromising on the quality of the staining. I wish to express my heart felt gratitude to Dr. Veena R General pathologist for evaluating the slides, Mr KP Suresh for statistics details and DELNET service New Delhi for providing most of the articles used in this study. Culling´s CF, Allison RT, Barr WT. Culling′s Histological Technique Processing. 4 th ed. London: Butterworths and Co-Publishers; 1985. p. 51-77. Bancroft JD, Gamble M. Theory and Practice of Histological Techniques. 5 th ed. Missouri: Harcourt Publishers; 2002. p. 85-108. Microwaves Processing Technique for Microscopy. Available from: http://www.wwwebsciences.com/papers/microwaves.htm#stimulator. [Last accessed on 2010 Oct 21]. Kok LP, Boon ME. Microwaves for microscopy. J Microsc 1990;158: 291-322. Sivadas P, Kumar H, Lakshmanan C, Bhardwaj JR, Kumar H. Microwave stimulated fixation and rapid processing of tissue for Histopathology. Med J Armed Forces India 1996;52:157-60. Mayers CP. Histological fixation by microwave heating. J Clin Pathol 1970;23:273-5. Boon ME, Kok LP, Ouwerkerk-Noordam E. Microwave-stimulated diffusion for fast processing of tissue: Reduced dehydrating, clearing, and impregnating times. Histopathology 1986;10:303-9. Hafiz S, Spencer RC, Lee M, Gooch H, Duerden BI. Use of microwaves for acid and alcohol fast staining. J Clin Pathol 1985;38:1073-6. Moorlag HE, Boon ME, Kok LP. Microwave methods for reducing staining time to seconds. Stain Technol 1987;62:357-60. Kennedy A, Foulis AK. Use of microwave oven improves morphology and staining of cryostat sections. J Clin Pathol 1989;42:101-5. Chiu KY, Chan KW. Rapid immunofluorescence staining of human renal biopsy specimens using microwave irradiation. J Clin Pathol 1987;40:689-92. Leong AS, Milios J. Accelerated immunohistochemical staining by microwaves. J Pathol 1990;161:327-34. McCluggage WG, Roddy S, Whiteside C, Burton J, McBride H, Maxwell P, et al. Immunohistochemical staining of plastic embedded bone marrow trephine biopsy specimens after microwave heating. J Clin Pathol 1995;48:840-4. Estrada JC, Brinn NT, Bossen EH. A rapid method of staining ultrathin sections for surgical pathology TEM with the use of the microwave oven. Am J Clin Pathol 1985;83:639-41. Login GR, Dvorak AM. Application of microwave fixation techniques in pathology to neuroscience studies: A review. J Neurosci Methods 1994;55:173-82. Kok LP, Visser PE, Boon ME. Programming the microwave oven. J Neurosci Methods 1994;55:119-24. Babu TM, Malathi N, Magesh KT. A comparative study on microwave and routine tissue processing. Indian J Dent Res 2011;22:50-5. Shruthi BS, Vinodhkumar P, Kashyap B, Reddy PS. Use of microwave in diagnostic pathology. J Cancer Res Ther 2013;9:351-5.